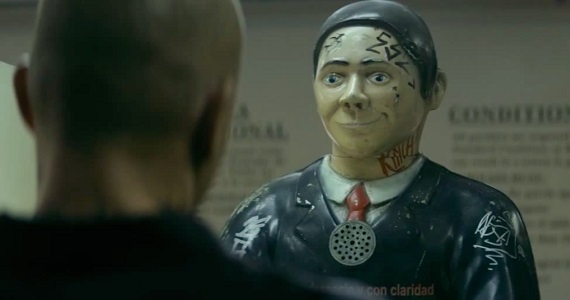 First 'Elysium' Clip: Would You Like To Talk To A Human? Elysium, Neil Blomkamp's long-awaited and eagerly anticipated follow-up District 9, looks like it boasts a plethora of effects-driven action (both digital and practical alike). The trailers and featurettes for the film show off an array of futuristic armaments and technologies, ranging from powered armor and rail guns to androids, hinting at mayhem that ensues when these elements clash against one another. But Elysium, a narrative about class inequity and privilege, is also about modern social issues and high-concept world-building - and a newly released clip (above) manages to capture both pursuits in under a minute. If you've been keeping up with the onslaught of trailers being released for the movie, which hits theaters in early August, then this scene - and the details it showcases - should be fairly familiar. In Elysium, the majority of humanity lives on Earth, now a third-world planet where everybody hustles just to scrape by day to day, while everyone else lives in absurd luxury and with access to limitless medical wonders on the titular space station. In this bit of footage, we meet our hero, Max (Matt Damon), as he unsuccessfully attempts to explain away a misunderstanding (teased in previous promotional materials) to an automated parole officer. Eventually, we know that Max comes into possession of an exosuit that gives him superhuman strength, and he makes a bid to sneak aboard Elysium to cure himself of radiation cancer - and also save the life of his friend's (Alice Braga) ailing daughter. Here, we meet him before he's given the ability (and the equipment) to fight back against the oppressive system set in place by the powers-that-be. This is a world where those inhabiting Earth have been all but abandoned to their own devices, with nothing but unaccommodating robots to turn to for aid. As portrayed in the scene, Blomkamp's vision of the planet is cramped, gritty, and far too lived-in if the sheer number of people waiting in line behind Max suggests anything. While this bit only completes a partial moment we've already seen play out in trailers, it's exciting to view a full beat from the film regardless - especially since it does its job so well, setting tone, establishing plot, and introducing us to our everyman protagonist. With less than a month until Elysium's opening day, it's possible that more action-oriented clips might be on the horizon, but for the time being this is a very cool, if brief, little teaser. Elysium arrives in theaters on August 9, 2013.